This extremely social bunch of tortoises cavorted in the courtyard of the Lake Victoria Hotel. The tortoises in the Kinixys genus all have a hinged shell that can close over the back legs, thus protecting them more completely. The hinge is clearly visible in this photo. Only two Kinixys species live in Uganda, K. belliana and K. erosa. 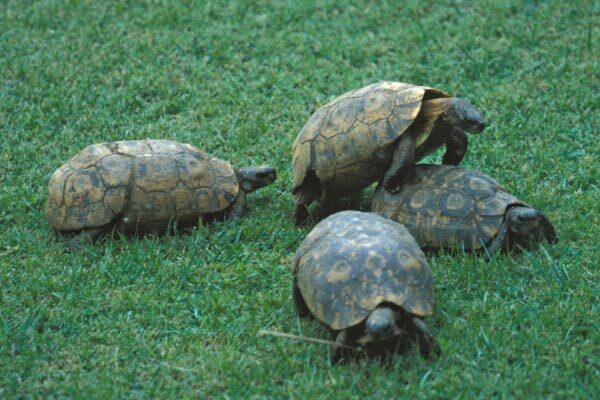 These tortoises seemed large enough to be K. erosa (the largest species in this genus), and they do not obviously have the typical distinctive pattern of K. belliana. I first identified them as K. erosa for this reason, but Kinixys expert Christopher Hobson was kind enough to identify them conclusively as K. belliana based on his long experience with the species.